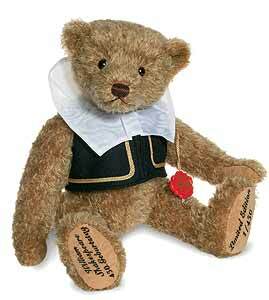 Teddy Hermann William Shakespeare Bear, fully jointed and made of the finest dark golden brown mohair. This wonderful item is a limited edition of only 450 pieces worldwide. Item number 155126, safety eyes, synthetic filling material, non growler, total size 30cm. ONLY 1 LEFT AT THIS CLEARANCE PRICE!